For me, wolves are easy to love, and hard not to cry about. For starters, they are beautiful animals—strong, smart, fast, muscular, lean, furry, and at times they smile. As a friend (and fellow pack member) of dogs, I feel a natural affinity with wolves too. Dogs are, after all, the likely descendants of wolves who became friendly with humans, to our mutual benefit (you toss me a bone, and I’ll guard the cave). But besides their aesthetic appeal and doggish familiarity, they reflect what I like best in me, and what I and the rest of my human clan exiled from our nature a long time ago—our free, clear, and purposeful animal selves. Wolves are family animals, usually loyal to their mates and committed to their pack and pups, offering playful, affectionate, fierce, watchful, dedicated, and at times tough love. They are fastidiously clean, good den architects, and clever hunters who only take what they need and no more. They are highly intelligent and aware, with a sense of smell about 100 times more keen than our own, the ability to hear 6 miles away in the woods and 10 miles away in the open, and excellent eyesight trained to detect even minute movement. Their adaptive fur coats keep them warm in harsh winter and cool in hot summer, creating an almost impermeable insulating shield of warm (neither cold nor hot) air. They adapt to feast or famine, capable of eating 22 pounds of meat at a time or going for days with no food. Their lives are at once simple and complex. They live and die for their pack, following the herd with the seasons and avoiding people as much as they can. Long before Europeans brought Small Pox, guns, and wolf-hating to North America, indigenous Indian tribes revered the wolf. They admired the wolf’s hunting ability and recognized the important role wolves play in ecosystems. The Cheyenne credited their tribal survival to the hunting skills they learned from wolves. Other tribes ascribed healing abilities and creationist stories to wolves, believing wolves made the land and the living things upon it. Such beliefs are not surprising given that wolves help keep herds healthy by feeding primarily on sick, old, and injured animals and that they sustain biodiversity by providing crucial food for animals such as opossums, ravens, raccoons, coyotes, vultures, and foxes who feed on the remains of their kills. The fact that there is no recorded case of a wolf killing a human in North America has long been eclipsed by an irrational fear and hatred of wolves that stretches back to the time of the Inquisition. The fear-mongering Roman Church exploited sinister images of wolves and a widespread belief in werewolves in Europe at the time to exert secular control. Tragically for wolves worldwide the legacy of such superstition nearly led to their extinction by the early twentieth century. In The Ninemile Wolves, Rick Bass describes in painful detail how in the nineteenth and twentieth centuries wolves were hunted for bounties, poisoned, trapped in metal vices, and fed meat laced with crushed glass. Understanding The Call of the Wild describes still worse wolf extermination methods, including setting traps that caught wolf pups on giant hooks outside their dens, injecting captured wolves with mange and releasing them to spread the disease to their pack, drowning them in their dens, using horses to pull off their limbs, and burning them alive. With the help of the U.S. and Canadian governments, the estimated 2 million wolves in North American had been reduced to the brink of extinction by the 1930s, with only a few hundred remaining. Although scientists have come to understand the vital role of wolves in the wild, and many of the prevalent misconceptions about wolves have been proven to be patently false, the species’ survival remains precarious. In Alaska, where wolves are not protected by the Endangered Species Act, aerial shooting of wolves is legal and encouraged by the government. Wolves and bears are chased by plane to the point of exhaustion and then shot at point blank range. According to Defenders of Wildlife, Governor Sarah Palin offered a $150 bounty for the severed forelegs of wolves and has consistently used state funds to fight initiatives to protect wolves and bears (including pregnant bear sows) from a systematic aerial hunting program of extermination. • Only 0.11 percent of cattle losses were due to wolf predation. • Coyotes killed 22 times more cattle than wolves did. • Domestic dogs killed 5 times more cattle than wolves did. • Vultures killed twice as many cattle as wolves did. • Human thieves took 5 times as many cattle as wolves did. Just this week on October 14, 2008, some much-needed good news arrived for wolves. The U.S. Fish and Wildlife Service formally withdrew the rules that would remove Northern Rockies wolves from Endangered Species Act protections, officially placing them back on the list. This is great news for Yellowstone wolves and the Yellowstone ecosystem. Unfortunately, wolves in Alaska are still under continual threat from aerial hunting, diminishing their numbers and endangered their survival in that region. According to the Alaska Department of Fish and Game, approximately 800 wolves have been killed in Alaska in the last four years. And wolves everywhere face the constant threat of illegal hunting, habitat loss by human encroachment, and climate change. Recent studies in the Yellowstone area provide further evidence of the ecological importance of wolves. According to Defenders of Wildlife, through what is know as the cascade effect, wolves, as large predators, exert far-reaching influence over a wide range of species in their environment. By keeping the elk population in balance, the reintroduction of wolves has resulted in less grazing pressure on the plant base, allowing, for example, stream bed vegetation such as aspen and willow to regenerate. These restored trees in turn have reduced soil erosion and created better habitat for native birds, fish, beaver, and other species to return and flourish. The return of wolves to the area also has reduced the coyote population, which had exploded in response to their absence. By reducing the coyote numbers by as much as 50 percent in some places, the presence of wolves has led to an increase in species such as pronghorn and red fox. But supporting wolf recovery is about more than reinstating ecological balance and biodiversity. Ending the persecution of wolves is a path to our own redemption, both environmental and moral. They have a rightful and necessary place in the environment that we share, and it is in our best interest to acknowledge and respect their vital role as fellow predators. Contrary to European wolf lore, the wolf is not a vicious monster. The evil we saw and still see in wolves is an image of ourselves we projected onto them. If we don’t like what we see in the mirror, saving the wolf is the best way to change the human face staring back at us. 1. Join Defenders of Wildlife to support their efforts on behalf of wolves. 2. Sign a petition asking Governor Sarah Palin to ban aerial hunting of Alaska’s wolves. 3. 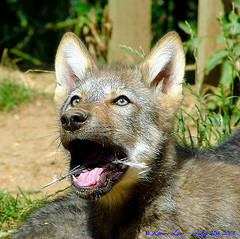 Adopt a wolf at Wolf Haven International so they can expand their wolf habitat areas. 4. Vote for Earth-aware politicians who will fight for wolves, climate change solutions, and environmentally sound policies. 5. Volunteer at a wolf-advocacy organization or wolf refuge. Here is a comprehensive list of wolf organizations so you can find one in your area. Julie Hall is the author of A Hot Planet Needs Cool Kids: Understanding Climate Change and What You Can Do About It and cofounder of ProgressiveKid. Image by Keven Law, 2008, Creative Commons license.